A feeding of 5000 at Kempton Park Racecourse is among the events lined up during next month’s first-ever National Weekend of Invitation (15-17 June). The initiative is supported by church leaders of several denominations, including the Bishop of Durham, Rt Revd Paul Butler, who became a Christian after being invited to church as a teenager. Many churches are already preparing for the weekend. On the evening of Friday 15 June, a team from St Saviour’s, Sunbury-on-Thames will knock on doors, offering to pray for people and inviting them to a special service on Sunday 17 June, called Joy@KemptonPark. 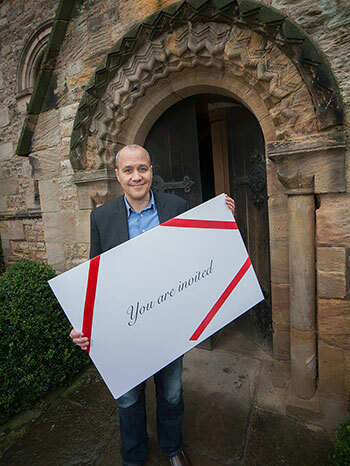 Meanwhile, St Mary Magdalene in Sale have planned a three-week sermon series on the culture of invitation, leading up to a number of special guest services. The National Weekend of Invitation follows on from Thy Kingdom Come, the Archbishop of Canterbury’s season of Pentecost prayer focusing on evangelism. “Over the years we have discovered that about seven out of 10 Christians feel God may be prompting them to invite someone to church,” said Michael Harvey. “However, eight out of 10 have no intention of doing so. We fear rejection, of failing and getting it wrong. We imagine God is only pleased with success. This creates a fear to invite, in case we fail. And, if we do invite, a sense of failure if we get a negative response.